An augmented reality headset has been shown off at the TED (Technology, Entertainment and Design) conference whose makers say could transform computing and communication. 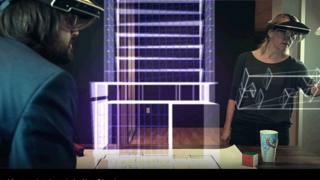 The Meta headset shows digital content superimposed over the user's view that they can manipulate with their hands. They can also use it to make a phone call and "see" the person in 3D. However, there remains questions about how willing people will be to wear headsets for such tasks. Augmented reality layers a digital world on top of the physical one. Some experts believe it has more real-world uses than virtual reality, which separates the user from their real-world surroundings. The demonstration at TED showcased the capabilities of the Meta 2 development kit. Meta founder Meron Gribetz said: "We are creating an experience that merges the art of user interface design with the science of the brain, creating 'natural machines' that feel like extensions of ourselves rather than the other way around. "For example, our natural hand motion doesn't rely on clicks or buttons, thereby maintaining the flow and connecting people to each other and the moment." It has had an enthusiastic reaction from those who have tried it. Robert Scoble, an influential futurist at data hosting firm Rackspace, has described it as "the most important new product since the original Macintosh." Mr Gribetz said he was inspired to create the machine while watching people on their mobile devices in a New York bar. He said he thought that tools that allowed people to see and share content would be preferable to users "hunched over a small rectangle". "I was thinking about how holograms can replace computers," he explained. "If we can put a digital layer into the real world imagine what that could mean for storytellers and brain surgeons." The firm was founded in 2012 and the first Meta prototype was a home-made affair, built with an oven-heated knife, a hot glue gun, and the best components Mr Gribetz could get his hands on. In five years time he predicts that the headset will have shrunk to the size of a thin piece of glass. The visor on the headset is see-through, to allow holograms to appear properly anchored to the physical surroundings using positioning tracking, so people using the technology always feel oriented. The firm has told developers they will be able to obtain units by mid-2016. Trying Meta feels a bit like being in Minority Report. 10 screens appeared in front of my eyes and I moved them around by poking on the screen and lifting it to another place. Being a policeman of the future is all very well, but more visceral to me was the ability to go onto an Amazon webpage and literally remove a pair of trainers, walk around them, look inside them and even attempt to try them on. I could see the huge potential of this technology for schools - the human body can be lifted out of a page and turned into a 3D model, which you can then pull apart to separate skin from skeleton. Perhaps the most impressive part of the demo was when I was asked to call one of Meta's employees via a button on the virtual screen. On answering, he appeared before me as if he was sitting close by. Pretending for a moment to be architects redesigning the Sydney Opera House, the building popped up in front of me. It offers huge potential for collaborative working. But one of the biggest downsides for me was how you handle content. Currently, you have to almost punch it, which doesn't seem all that natural and, on several occasions, I lost control of the objects I was manipulating. I was told that this will improve over time but it reminds me that, however Iron Man it may seem, the technology is still very much in its infancy.